Jared Leto (born 26 December 1971 in Bossier City, Louisiana), is an Academy Award winning American actor and singer-songwriter. He is known for his role as Jordan Catalano in the TV series My So-Called Life and starred in the movies American Psycho, Alexander, and Suicide Squard. 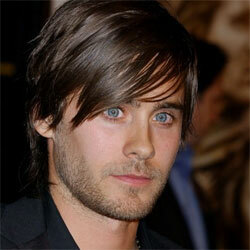 He is the lead singer for the band Thirty Seconds to Mars. He is the face for Gucci fragrances since 2016.